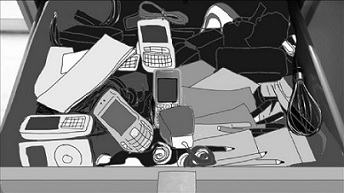 Prompted by a personal experience, scrolling through an old Nokia phone and discovering a three-year old dialogue with a previous partner, the collaboration between Victoria Mapplebeck of Royal Holloway and Any Glynne of Mosaic Films sought to relay this story in a 10 part animated series. Whilst the series wasn’t completed a trailer and storyboard were produced, also research and development went into creating a web emulator for the public to submit their own text message content. Despite not reaching competition the project has received international attention and acclaim, on February 14th 2014 the project launched at the BALTIC Centre for Contemporary Art in Gateshead. In April Wired featured an interview with Victoria regarding the project, and Victoria has had two articles published, one in The Conversation, the other in The Huffington Post. The project received the 2014 Pixel Lab Prize and won The Merging Media Prize for Best Cross Platform European Project during a competition during a Power to the Pixel event. Additionally, Merging Media selected Text Me as one of the European finalists in their Pitch 360 Competition. Finally the project has been presented at the Firestation Arts Centre in Windsor.